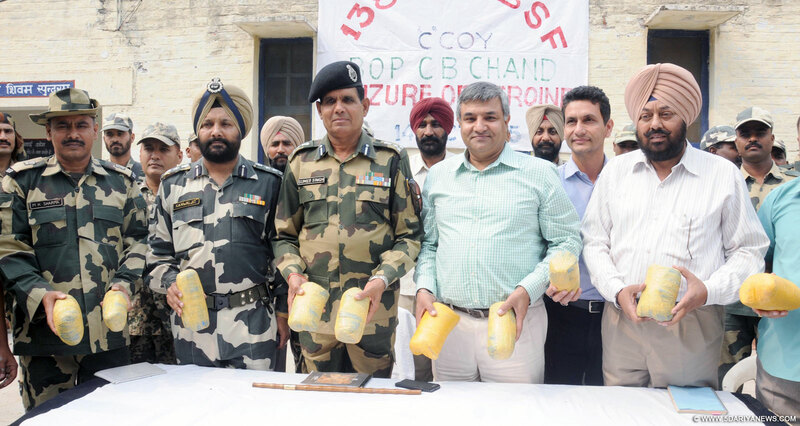 Border Security Force (BSF) troopers recovered 12 kg of heroin along the India-Pakistan border after an exchange of gunfire with suspected Pakistani smugglers, a BSF spokesman said on Wednesday.The recovered heroin is valued at Rs.60 crore in the international market.The heroin was recovered near Border Out Post (BOP) CB Chand in Amritsar sector, nearly 280 km from Chandigarh. It was a joint operation of Punjab Police and BSF. "Based on information about smuggling of narcotics through International Border, a special ambush was laid by Punjab Police and BSF troops at BOP CB Chand. The ambush party observed suspicious movement of smugglers near the International Border and started monitoring their activities," a BSF spokesman said. "The smugglers were seen approaching the border security fence along the water channel. BSF troopers challenged them to stop but the smugglers opened fire. The smugglers managed to escape taking cover of paddy crops and mounds," the spokesman added.With the latest recovery, the BSF has seized nearly 231 kg of heroin this year in the Punjab sector. The seizure of heroin in 2014 was 361 kg in the Punjab sector, which was the highest in any year.